State Representative Susan Lynn addresses the audience at a meet and greet Thursday night. In the background is Larry Davis of the Cannon County GOP. 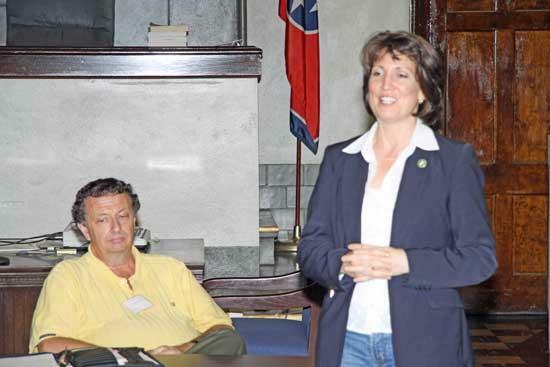 The Cannon County Republican Party hosted a meet and greet for State Representative Susan Lynn Thursday night at the Cannon County Courthouse. Representative Lynn is a candidate for the 17th district Tennessee Senate seat currently held by Mae Beavers. Lynn told those in attendance that she was pro life, endorsed by the National Rifle Association, and that she is believer in crossing party lines in order to get legislation passed. "We do have to work together but you also have to hold to your conservatives values, and I am a conservative," Lynn said. Lynn is chairman of the House Government Operations Committee, which oversees all state departments, boards and commissions. "We review them to see if they should still exist," she said. The committee also approves the rules that are created after laws are passed, she said. Lynn also said that improving roads and bridges is one of her top priorities as a representative, and that she will work for funding to improve Cannon County's transportation infrastructure if she is elected senator. "I'm proud that over $3 million in TDOT funds have come to my district since I was elected."